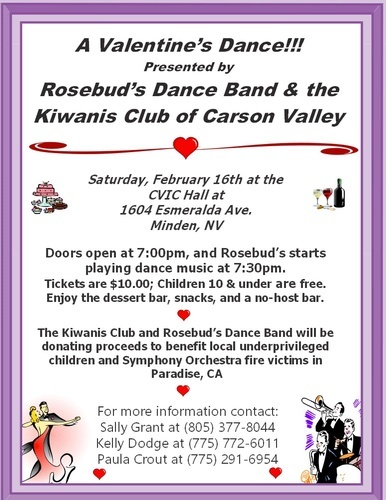 Kiwanis Club of Carson Valley and Rosebud’s Dance Band are presenting 'A Valentine Dance'. 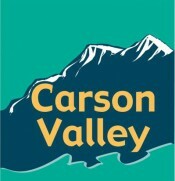 Join us Saturday, February 16th at the C.V.I.C. Hall in Minden, NV. for an evening of music, dancing and fun. Doors open at 7:00 pm and Rosebud’s starts playing music at 7:30pm. Tickets are $10 each and children 10 and younger are free. Pay at the door. Enjoy the dessert bar, snacks and a no host bar. The Kiwanis Club and Rosebud’s will be donating proceeds to benefit local children swim scholarships and Symphony Orchestra fire victims in Paradise. Tickets are $10 each and children 10 and younger are free. Pay at the door.